Trevi Fountain back in action. All photos by Erica Firpo. Fathom contributor and Rome-based food writer Erica Firpo took a fresh look at the Eternal City and found the best new restaurants, hotels, and historical attractions hiding in plain sight. ROME – Rome is a city that doesn't always follow the rules or live by definition, especially when it comes to the concept of newness. Living here, I've languished in the old-school vibe and old habits, while occasionally thirsting for that take-the-wrapping-off new feeling. I've come to the conclusion that newness is relative. According to most definitions, new is something that is produced, introduced, or discovered recently. In the Eternal City, time is elastic, and new discoveries live among the most ancient things. New can be an architectural endeavor like Zaha Hadid's museum of 21st-century art MAXXI, a conservation project like the Colosseum clean-up, or simply a different perspective. In Rome, discovering newness is just a matter of patience and perseverance. There is always something new going on if you just know how to look. Palazzo della Civiltà Italiana, now Fendi headquarters. The recently opened Imperial Ramps. Let's start at the very beginning. The Roman Forum, perhaps the city's poster child for old, hasn't had a new building in millennia. 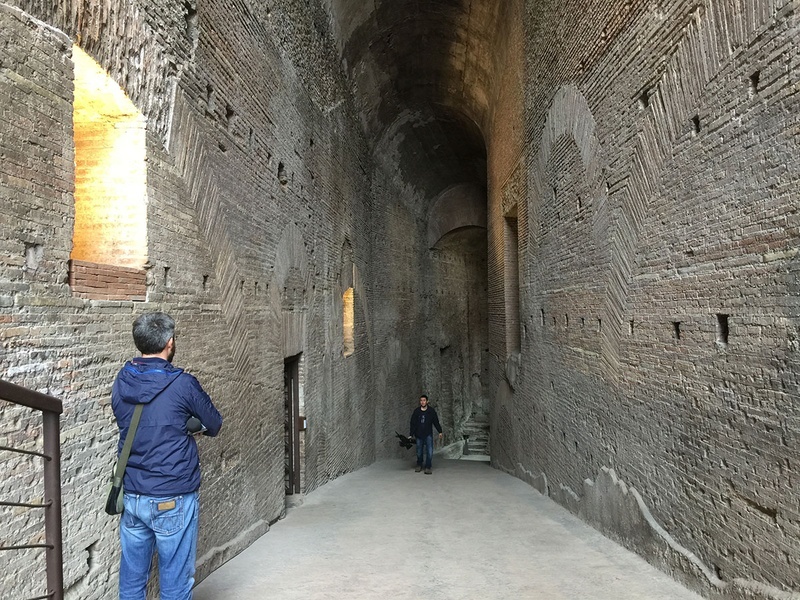 But this October saw the opening of the Imperial Ramps, a series of seven ramps that once connected the center of the Forum to the Emperor's palace on the Palatine Hill. In other words, not a walk for the average Roman or visitor, until now. Like the Imperial Ramps, the 2000-year-old subterranean Basilica at Porta Maggiore was never on the tourist to-do list, but now visitors can make appointments to walk through the lavishly decorated pagan worship site, about 40 feet underground. 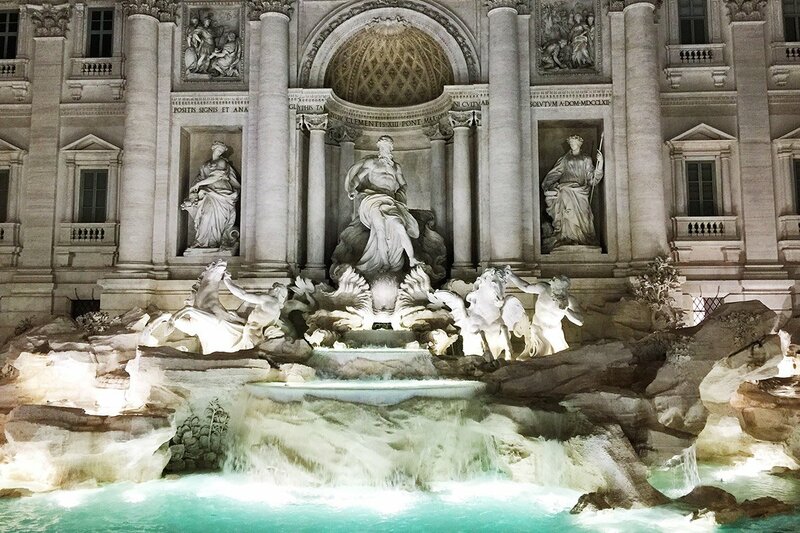 Meanwhile everybody's favorite Trevi Fountain is finally flowing after more than a year under scaffolding (watch the live feed), having undergone a lavish and careful renovation at the hands of local company Fendi. My favorite new old thing is the Pyramid of Cestius, another more-than-2000 year old tomb that had a makeover as well as new visitor program. While Rome hasn't had a new mega-museum since the 2010 inauguration of the MAXXI, the gorgeous Museum of Art and Architecture of the 21st Century, the city definitely has a new attitude in its museums. MAXXI has opened the doors to its permanent collections for free on weekdays, and Rome's Musei in Comune, a network of city-run museums, responded with its eight piccoli museums, ranging from antiquities to contemporary art. But the new that I really love is about seven decades old — the EUR neighborhood, an area that was designed in the 1930s to be the new Rome. Every building in the plan was meant to be a monument, with long lines, white travertine, and cinematic flair. The most theatrical is the Fascist monument Palazzo della Civiltà Italiana (better known as the Colosseo Quadrato) which is now Fendi Headquarters. 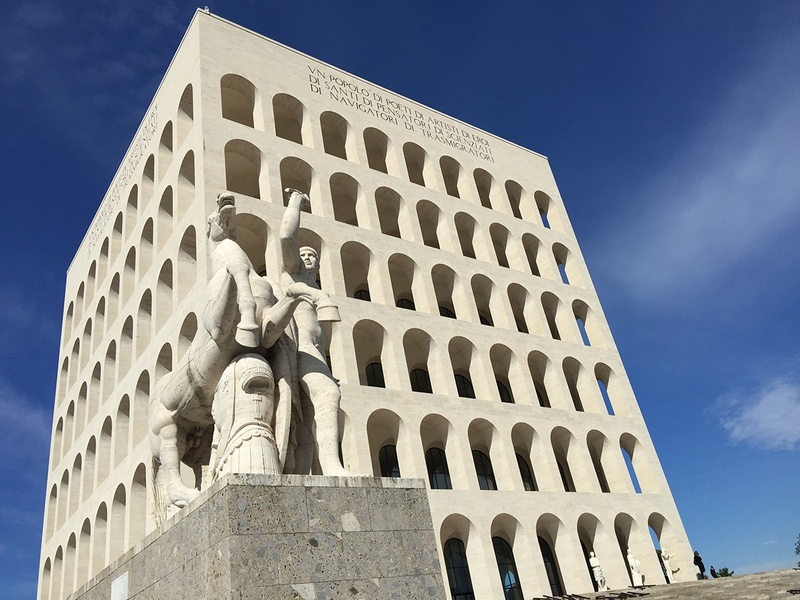 With Fendi in residence, the Colosseo Quadrato is open to the public — something that has never happened in its 72-year history. Visitors can walk around the ground level, reveling in its epic arches and colossal statuary, and get a glimpse at how the EUR neighborhood was intended to be by walking through the art exhibition A New Rome. But there's more news from the venerable fashion house: Palazzo Fendi is opening in the city center after year-long renovations. The ground-level and first-floor boutique are all about the clothes. 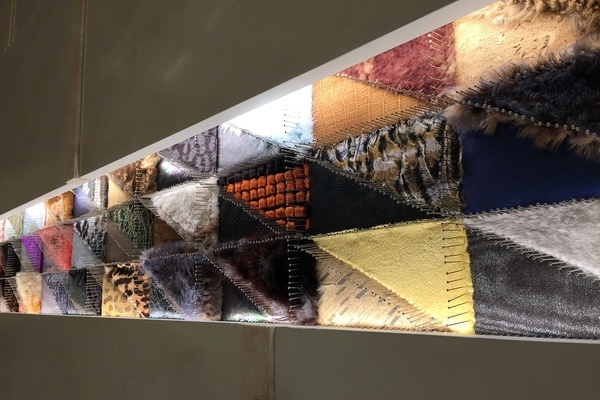 The ultra modern design includes details like a cylindrical glass elevator, undulating travertine, and "art" made from pieces of dyed fur and skins. A window on the first floor affords a view into the studio where furriers are working and designing. The upper levels are Fendi Private Suites, seven very expensive apartments featuring the very best of artisanal craft and modern design. Finally, next March will see the opening of the Japanese izakaya-style restaurant Zuma on the rooftop. Of course, along with the new-old comes the new-new, and variations in between, in the form of noteworthy hotels, restaurants, and bars. 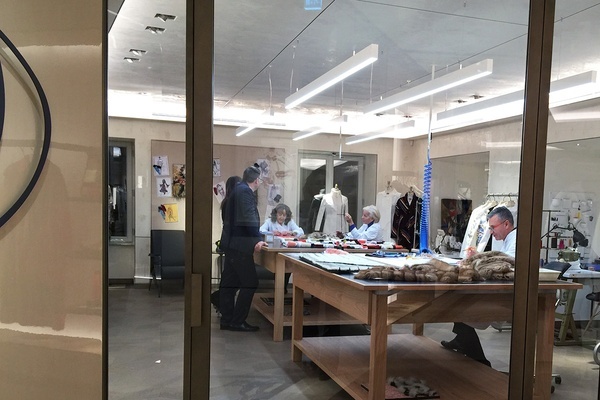 Furriers working inside Palazzo Fendi. Wall art at Palazzo Fendi. DOM is what happens when Renaissance meets urban hip. In this case, it's a 24-room boutique hotel in a former monastery on Rome's uber street Via Giulia. Imagine Warhol prints intermingling with 16th-century marble inscriptions in dark hallways and you'll get the picture — contemporary, minimal design that's refreshingly meditative. DOM Deer Club is a sought-out sanctuary for Rome's glitterati — a triad of evening pleasure in the form of a black and gray lacquered lounge and restaurant and panoramic rooftop bar. The pared-down G-Rough is that chic Italian home you've always dreamed about: mid-century design pieces, in situ contemporary art, and original 17th-century frescos in each of its ten rooms. You had better brush up on your Italian, as in design icons Gio Ponti, Gino Sarfatti, Carlo Scarpa, and Ico Parisi, who serve as inspiration. The location is key: G-Rough is at the edge of Piazza Navona and just across the road from Campo de' Fiori. Slightly off the radar and lighter on the pocket is The Corner, on viale Aventino near the Circus Maximus and Aventine and Testaccio neighborhoods. The eleven-room boutique hotel is located in a beautiful Belle Epoque palazzo. Each room is a celebration of rich color as well as original 1900s detail, while design is contemporary and minimal. Casa Coppelle is a Paris-in-Rome restaurant and lounge that's at once haute noir and Napoleonic. Heavy saturated colors, rich fabrics, black-lacquered tables, luxurious armchairs, and beautiful somber 18th-century portraits set the tone for the nouvelle Franco-Roman cuisine by chef Fabio Rossi. Also of note is the Krug cocktail bar where barman Diego Rampietti holds court. For some reason, chatter about Chorus has been pretty quiet, and, as much as I'd like to keep the secret, I won't. Master mixologist Massimo d'Addezio and chef Andrea Fusco took over a gorgeous, Fascist-era reception hall at the Vatican's Auditorium and have turned into one of the city's best, if not the most stylish, cocktail lounges. High ceilings, original marble, velvet divans, and a glowing bar counter are the perfect backdrop to D'Addezio's clever cocktail concoctions. The table spread at Tiberino. 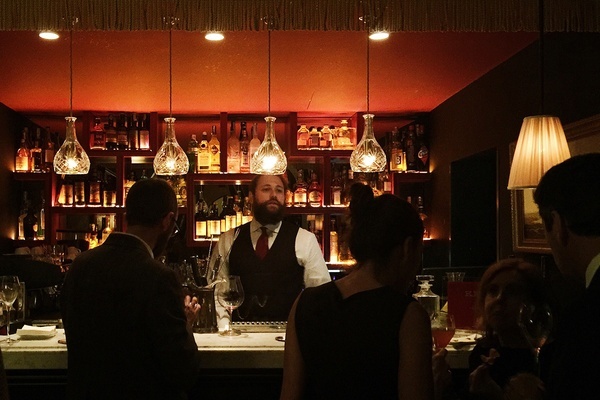 Hassler Bar is one for your little black book. Don't be daunted: Inside the hallowed grounds of the Hassler, one of Rome's original five-star luxury hotels, is a lounge area. And just behind that is a small, round, leather paneled-bar and humidor, straight out of the 1920s. 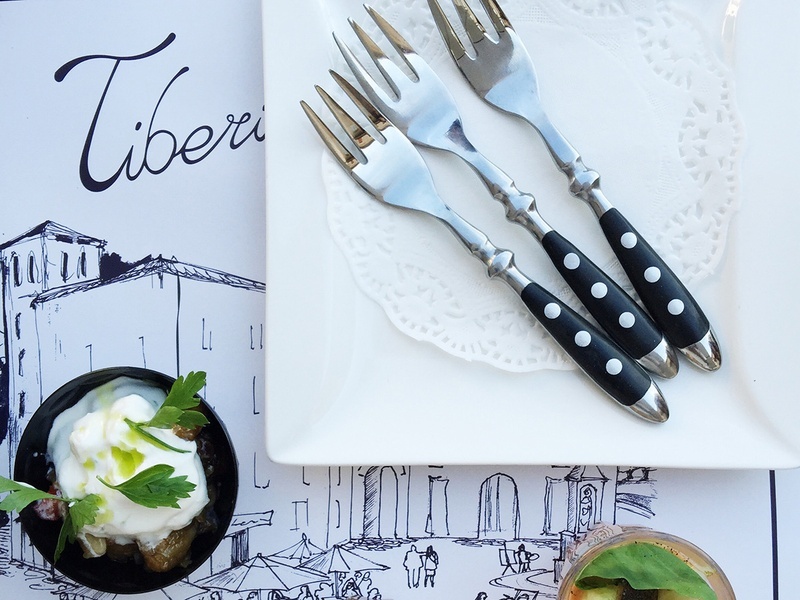 Tiberino is a charming gastro-bistro with a slightly maritime vibe that at once befits its location — tiny Tiber Island (probably the oldest location in Rome) — and owner Giuseppe Bugnaro's passion for rowing. Bugnaro upgraded his family's 80-year-old bar and brought in chef Luca Mattana (formerly of Michelin starred Il Pagliaccio) to its helm. Mattana's cuisine could be described as a modern Roman and Sardinian fusion (Mattana is from Sardegna). His success is simplicity and a tenacious attention to detail. In other words, Mattana is not trying to reinvent the wheel with overly fanciful recipes, but will artfully work on a dish until it is sublime. Sort of like the city itself.